If you or a love one experience these side effects, consult a doctor immediately. Daliresp | Roflumilast is a relatively newer medication used in the treatment of chronic obstructive pulmonary disease, also known as (COPD), which affects the lungs and airways. Daliresp | Roflumilast helps reduce the number of chronic obstructive pulmonary disease symptoms. It is not entirely known how Daliresp works, although it works as an inhibitor to selectively inhibit phosphodiesterase 4, which is a metabolizing enzyme found in lung tissue, and a common factor in COPD. Daliresp | Roflumilast works by decreasing the inflammation of the lungs. It comes in pill or tablet form, and is taken orally, either with or without food, up to two times a day. It is encouraged, for best results, that the medication be taken at relatively the same times, each day, to ensure more qualifiable results. Daliresp | Roflumilast cannot be used in the treatment of a sudden breathing problems or attacks. 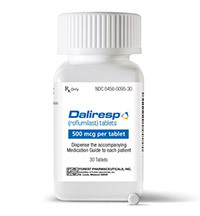 Consult with your health care provider for more information regarding Daliresp, or to see if Daliresp is right for you.